Pac-A-Nutrition Alpaca Crunch is an exciting nutritional product specifically designed for alpacas. 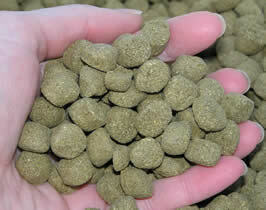 Its extrusion processing method allows alpacas to easier digest and retain more nutrients than with other forms of processing, such as pelleting, which is a hard compacted process. With extrusion there is no risk of choke because the crunch crumbles as soon as it comes in contact with the saliva in an alpacas mouth. Email us or call 785-284-2589 for more information about Pac-A-Nutrition.